Quebec City, Canada thrives on tourism, so just because temperatures in winter can dip deep past the zero mark, this historic city is open for business with plenty to offer visitors. 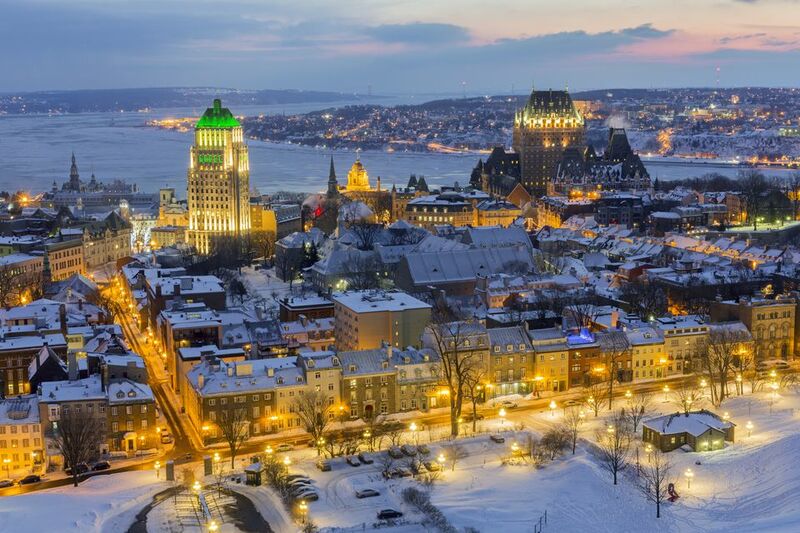 Unlike Montreal, for example, where the old town is much less busy between December and March, Quebec City is busy with people from all over the world who want to experience this historic, picturesque town in all its winter glory. The effort to get to Quebec City and the extra clothing you will have to pack (or buy when you realize how cold it really gets) pays off when you behold the beauty of this World Heritage Site illuminated for the holidays and blanketed in snow. In addition, special seasonal programming, including the world-famous ​Quebec Carnival, ensures there is plenty to keep visitors distracted from the freezing cold temperature. When you plan your winter visit to Quebec City consider several factors. Are you looking for an action-packed getaway or a quiet retreat? Weather-wise, any time you go to Quebec City between November and March, you should be prepared for plenty of snow and freezing cold weather, although January and February are the coldest. Thousands of people arrange their travels around the Quebec Winter Carnival that takes place at the in early February for 17 days. This time, along with the summer months, is the most popular time to visit Quebec City. For this reason, hotel and transportation rates are high and reservations are suggested. That said, Quebec City hotel rates are more reasonable than in many other popular Canadian cities, especially at mid-range chain hotels like the Quebec Hilton. If you go to Quebec City outside of Winter Carnival, the city is much calmer, unless there is a particular event or conference in town. These off-season times are excellent opportunities to get good deals on hotels. The Quebec Winter Carnival is the city's biggest draw and takes place over three weeks in February. Quebec's fascinating and rich history is best discovered on foot and by an expert. Join a guided sightseeing tour to best appreciate this extraordinary city. Try ice skating at any one of the outdoor rinks or skating trails through parks. Skates are often available to rent at reasonable rates. Each year an ice slide opens at the back of the Chateau Frontenac along the Dufferin Terrace. For $2, you'll be given a wooden toboggan to lug to the top. You will be shocked by the speed you reach on the way back down. Several downhill ski resorts are within an hour of Quebec City, with Mont-Saint Ann and Le Massif being the closest. Shuttles are available to and from the ski hills. Quebec City still not cold enough for you? Try a night at the Ice Hotel. Rooms will be available from January 4 until March 25, 2019, but you can visit as early as December 23, 2018. Valcartier Winter Playground resort is unadulterated slip-sliding winter fun 20 minutes away. Make a point of exploring outside the Old Town of Quebec City where it is less touristy and more authentically modern Quebecois. There are some excellent, more affordable restaurants outside of the walls as well. No matter how seriously Quebec City's cold weather is emphasized, there are always stunned looking tourists trembling across the cobblestone streets wearing painfully inadequate clothing, like a hoodie, jeans, and running shoes. Know before you head to Quebec City in winter that it is a northern climate with temperatures that generally hang around the sub-zero mark but may dip to -20 degrees C (-4 Fahrenheit) and feel even colder with the wind-chill factor. The good news is that Quebec City cold is mostly a dry cold and doesn't have the wet bite that other famously frosty cities have. Packing essentials for Quebec City in winter include insulated boots comfortable enough to walk in, warm parka, hat, gloves/mitts, long underwear (ideally not cotton) to wear next to skin, warm sweaters, and winter socks. Other items to include are snow pants, sunglasses, and sunscreen (snow is a great reflector of the sun and can result in sunburns). The biggest winter carnival in the world is held in Quebec City annually. Thousands of people head to Quebec to partake in the sub-zero merriment that is the Quebec Winter Carnival. Taking place at various locations across the city, the Carnival highlights and activities include ice slides, dog sledding, night parade, snow sculptures, and more. Part of the true beauty of Carnival is its authenticity and how the programming reflects and celebrates the city's rich history. Another reason Quebec Winter Carnival makes a great destination is its affordability. You pay once for access to three weeks worth of activities.